Combat creases in clothes, accessories, and linens the easy way with this little-known laundry appliance setting. Q: I’ve always been pretty simple with my laundry settings—hot water for whites, cold water for darks—and haven’t taken advantage of the other less-than-straightforward settings on my washer and dryer. What is Permanent Press, and when do I use it? A: Think of the permanent press setting on your washer and dryer as your first line of defense against unwanted creases in your favorite fashions. The setting—which evolved from the 1950s-era invention of permanent press fabric that was chemically treated to ward off wrinkles—sets in motion a wash or dry cycle that removes existing wrinkles in fabric and prevents new ones from forming. That alone reduces the need for manual ironing after a load, which can fade, shrink, or burn fabric over time. And, since the cycle is gentler on laundry than a Regular wash or dry cycle, it also maintains the color and condition of your clothes, accessories, and linens and prolongs their usefulness. But the setting is better suited for some clothes than others, so read on to learn how it works and how best to put it to use. In washing machines, it uses a combination of warm and cold temperatures as well as a fast wash and slow spin to de-wrinkle the load. The permanent press setting is more commonly found on traditional washers with agitators (spindles that twist and turn to remove dirt) but it’s also available on some high-efficiency washers that house fin-like impellers instead of agitators to remove dirt. Set the machine’s dial to “Permanent Press,” and the 30-minute cycle—which is five minutes shorter than the average Regular cycle—will wash your load in warm water and rinse in cold water with fast agitation. The warm water relaxes and removes creases in clothes, while the cold prevents color fading and shrinking. Then, during the spin (water drainage) phase of the cycle that occurs after the rinse phase, the washer transitions to a slow spin, which prevents the formation of new wrinkles in the laundry. In dryers, Permanent Press leverages medium heat to de-wrinkle laundry. Throw in five pounds of wrung-out laundry, turn the dial to “Permanent Press” or “Perm Press,” and the dryer’s setting will kick on at medium heat (usually between 125 and 135 degrees Fahrenheit) for either all or the majority of the 30- to 40-minute cycle. That’s both 10 minutes shorter and 10 to 15 degrees cooler than the average Regular dry cycle, a combination that helps smooth creases as the clothes dry. If your dryer includes a cool-down phase at the end of the permanent press cycle (not all dryers do), the dryer will transition to a cool temperature toward the end of the cycle to prevent fading and shrinking of laundry. This cycle is ideal for wrinkle-prone fabrics made of synthetic fibers. Permanent Press is best suited for washing and drying fabric made with synthetic fibers—e.g. polyester, nylon, acrylic, rayon, or knitwear; permanent press (no-iron) fabric; or fabric made with a blend of synthetic and natural fibers. While you can still safely use the permanent press setting to wash or dry fabrics made with purely natural fibers like cotton or jute, avoid using it on delicate fabrics like lace, cashmere, or silk. These delicates call for cold water, slow agitation, and slow spin throughout the wash cycle, and low heat during the dry cycle, which makes the gentle or delicate wash or dry cycle the best choice for washing or drying them. It’s most effective on lightweight, moderately soiled laundry. Since the slower agitation and spin rate at the end of a permanent press wash cycle are gentle on clothes, accessories, and linens, you should reserve it for lightweight clothes and accessories: dress shirts and pants, dresses, t-shirts, sweaters, scarves, socks, and bed sheets with light to moderate soiling. 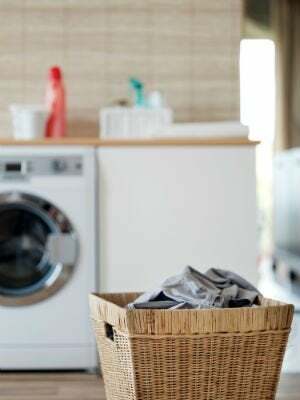 Heavy-duty clothes and linens like jeans, blankets, or towels—particularly those that are heavily soiled—need the faster agitation and spin of a regular or heavy-duty wash cycle to get clean. These heavy-duty wears also take longer to dry, which is why you want to put them through a longer and hotter regular or heavy-duty dry cycle. Put heavy-duty wears through a permanent press dry cycle, and they may come out slightly damp and require another dry cycle to get fully dry. Your load will require less ironing and, a bonus, less de-pilling. Synthetic fabrics are not only more prone to forming wrinkles but also pills, those balls of fiber on fabric that take a steady hand with a razor or an electric pill remover to shave off. The longer these fabrics stay in the washer or dryer, the more pills they develop. Thus, the shorter duration of a permanent press cycle results in clean, dry fabrics with fewer pills and wrinkles! • Manually iron the piece on an ironing board using the heat setting specified by the ironing symbol on the label of the piece. The good news: It should only take a touch-up! • Spritz warm water from a plastic spray bottle directly onto the wrinkled fabric, then dry with a hairdryer on low heat. Hover the dryer over the wrinkle no closer than two inches from the fabric until the heat smooths it over. • Spray a store-bought wrinkle remover like Downy Wrinkle Releaser over the offending wrinkles in the fabric, then let the fabric hang-dry completely to eliminate the crease. • Loosely pack items in the washer or dryer so that the appliance is no more than three-quarters full. 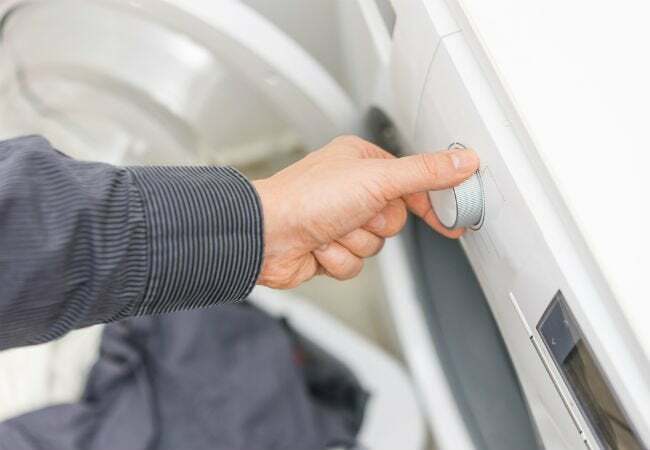 Laundry is more likely to crease when it has no room in the washer or dryer drum to move freely during the permanent press cycle. • Never wrap items directly around the agitator or impellers of your washer; they can get caught on them and wrinkle or tear. • Transfer laundry from the washer to the dryer immediately after the permanent press wash cycle ends (this is when it will be in its most wrinkle-free state) and start a permanent press dry cycle. • When a permanent press dry cycle ends, immediately retrieve the laundry from the dryer drum and hang or fold it. Left in an unfolded pile, items at the bottom of the pile are likely to develop creases under the weight of the pile.